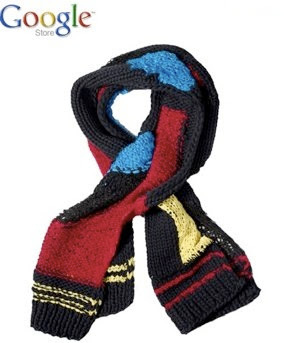 Google is selling “Google-inspired” scarves and other clothing to the public that were designed by emerging designers. Last year, designers who participated in a Vogue and Council of Fashion Designer program were asked to create a one-of-a-kind item inspired by Google in some way that reflected Google’s aura. Google transformed the finalists creations into iGoogle Artists themes but selected three of the designers to produce and sell their Google-inspired couture. Flora Gill designed an oversize, multi-yarn, intarsia hand-knit scarf incorporating silk bias trim with wool and nylon yarn. Inspired by Google’s multi-functionality and diversity, the scarf features Google’s signature colors and is designed to be worn in several ways. In case you were wondering about the “several ways” you can wear the scarf, we guess you can wear it as a headband, around your neck, or as an armband as a symbol of solidarity with the Googleplex. We don’t know about you, but to us the scarf aesthetically is not worth $300. We mean, come on, for $200 more we could get an iPad. You can also purchase Peace “Vintage” T Shirt inspired by the point on a Google Map that will set you back by $85. And for any jewelry fans out there, Google is peddling a $200 Old Fashioned Magnifying Glass Pendant, meant to be inspired by Google’s search.